← Wacky Wednesdays – Dots n’ Shots edition. 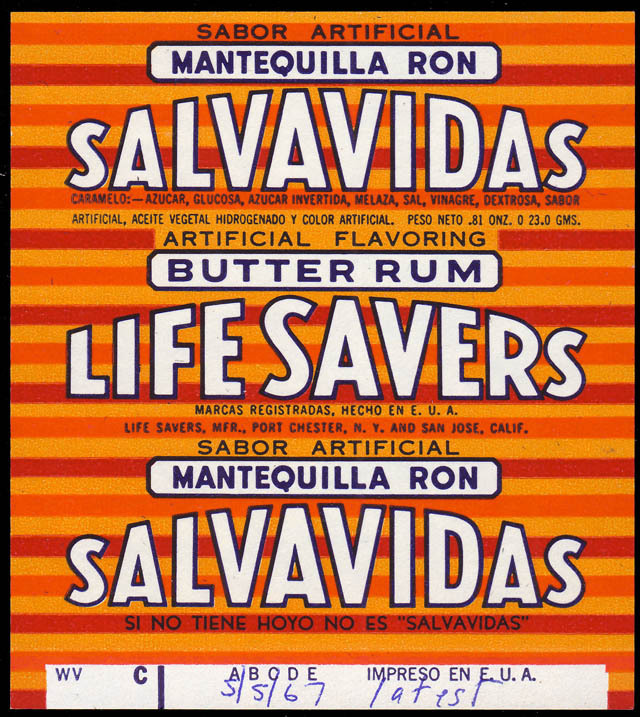 Prohibition Lifesavers: When Butter-Rum was Butter-Yum! 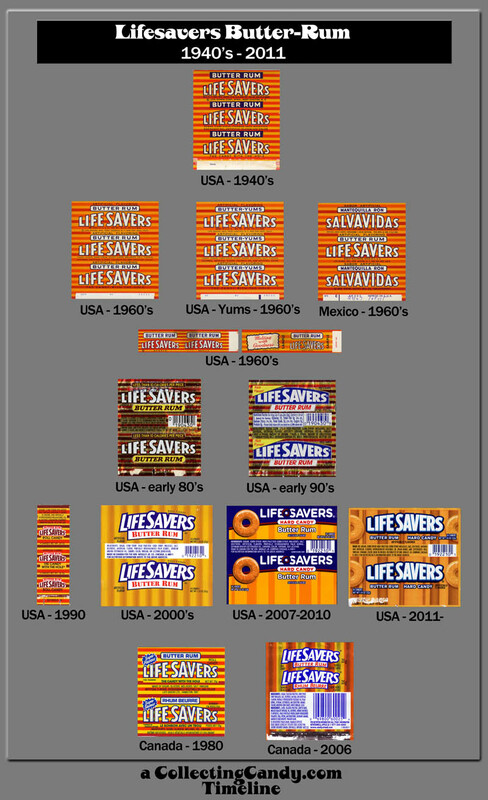 There are but a select few branded confections that can claim to have been around a century, and as of this year, Lifesavers is one of them. 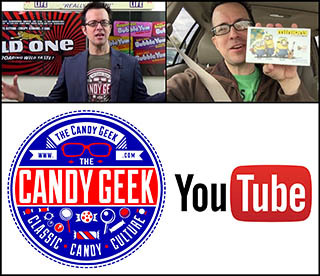 For a collector, Lifesavers provide such a history and array of offerings that you could have a hobby focused on them alone. 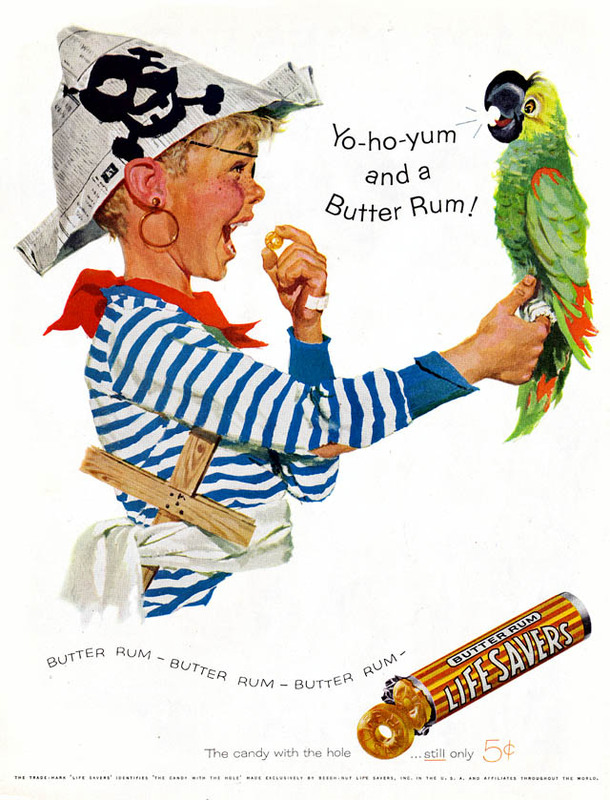 I’ve enjoyed the bits I’ve learned about the history of “The Candy with the Hole” and today I’m going to share one of the more colorful discoveries I’ve made about one particular flavor: Butter-Rum. Growing up, Butter-Rum was my favorite flavor of Lifesavers, so when I became a collector, they held a special place in my heart. 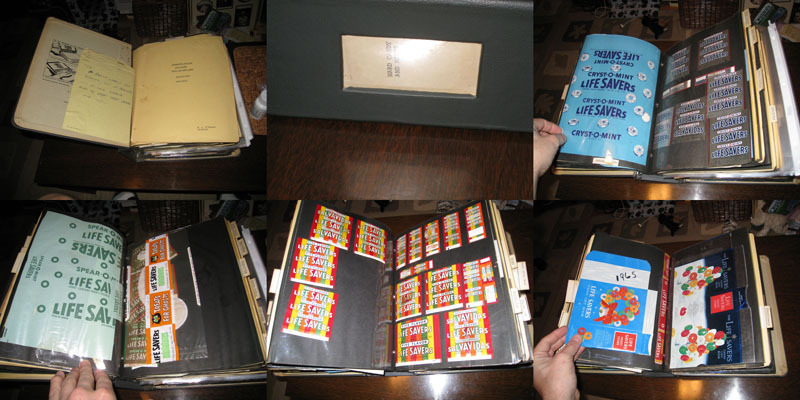 A few years ago, I had the opportunity to document a binder that was originally kept by an employee of Lifesavers, and passed down over the years. Within its pages were years of wrapper samples, saved in order to keep a record of what had come before. It is an extraordinary documentation, and it is unusual when things like this are kept, but so great when they are. This binder ended up with another marketing executive, who also happened to be a collector, and who was gracious enough to let me document the contents. I may dedicate a later posting to this archive alone, or I may simply bring up bits and pieces along the way. As I was going through this book, I came to a section dedicated to Butter-Rum wrappers, and then a page with a wrapper that looked just like Butter-Rum, but was called Butter-Yums. Now I had the standard wrapper in front of me, the exotic Spanish-language version, and the mysterious Butter-Yums. My first thought was to go to the source – the Lifesavers company. I went online and sent them an e-mail. I did get a response back that they didn’t have records going back that far, and they could not tell me what the Butter-Yums wrapper was. So, with the folks who owned the company, I hit a dead-end. So, the mystery was solved, or at least as solved as I was going to find. The idea of Butter-Rums being renamed due to some anti-alcohol state laws makes pretty good sense. 6 Responses to Prohibition Lifesavers: When Butter-Rum was Butter-Yum! 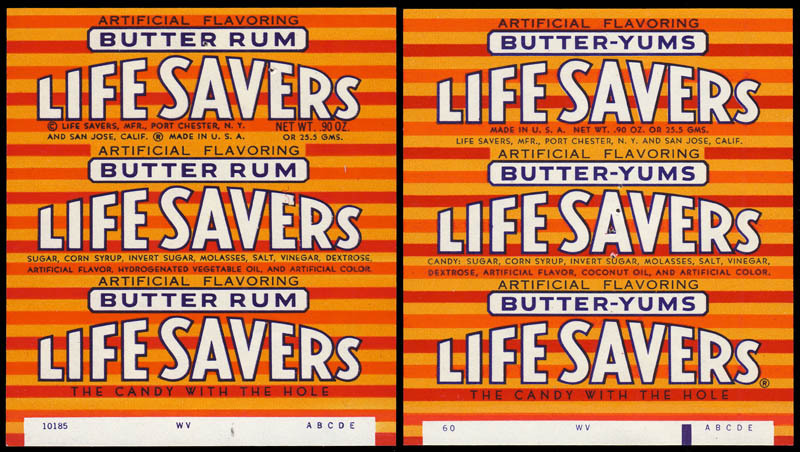 Butter Rum Lifesavers were always the first to go from my Christmas Lifesaver book. Eating something with the word “rum” in it felt like I was getting away with something. The Spanish wrapper says something like ‘If it doesn’t have a hole, it’s no a Lifesaver.” Different from the English one. Do you know if the Pirate ad was done by Norman Rockwell? He has a very distinctive way of drawing human faces, and it sure looks like his Saturday Evening Post covers to me. I love Butter Rum Lifesavers, but they do not seem as intensely flavored as they were years ago. Back then, they had much more impact. Today … mellow. THANKS for the article! LOVE me some butter rum life savers!!! :D! They used to be made in the good old USA. My present (2017) wrapper says made in Mexico. What a disappointment!